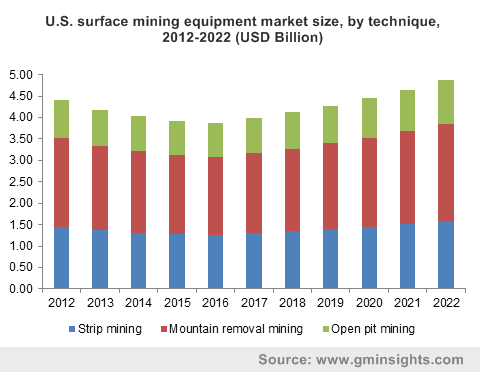 Surface mining equipment market size is projected to exceed USD 28 billion by 2022, growing at a CAGR of 3.6% from 2015 to 2022. Escalating demand for metal and mineral commodities is anticipated to drive the industry growth. Increasing mining activities and growing demand for technically advanced solutions mainly in developing countries is estimated to fuel the industry over the forecast period. It aids in cost optimization owing to its capability of crushing, cutting and loading in a single working pass. Technology innovation offers precision and helps in time saving by enabling the work process faster and easier. Proliferating use of this equipment facilitates in selective mining by producing high quality material as well as producing stable surfaces & embankments. In addition, it offers low noise, low dust and less damaging vibrations process hence enables effective mining in residential areas. It assures maximum exploitation of a mines and aids in reducing processing cost involved in crushing by producing small grains, thus eliminating the need of buying the additional crushing equipment. It also facilitates in reducing the need of wheel loaders and excavators owing to is capability of dumping the material into dumper trucks through a conveyor belt. Since, single machine performs multiple tasks it reduces the need of extra machines and man power. Usage of this equipment helps in avoiding blasting work and enables great precision while cutting steep and stable surfaces. It offers effective planning & coordination of the process, along with better operation and maintenance. Factors such as health and safety issues coupled with lack of skill technicians might hinder surface mining equipment market size growth. Flourishing mining activities in countries such as China and India are likely to exhibit potential growth opportunities to the surface mining equipment market. Increasing demand for diamond, iron-ore, coal and chromium is estimated to provide intense growth avenues to the industry. Mountain top removal mining equipment market size was valued at over USD 5.5 billion in 2014. The surge in the sector is mainly because it requires less number of workers and it assures maximum coal recovery as compared to the other conventional methods. Strip mining is anticipated to grow at a CAGR of 3.5% from 2015 to 2022 and it is likely to exceed USD 12 billion by 2022. Metallic ore accumulated around 46% of the overall surface mining equipment market share in 2014. It is likely to reach USD 13 billion by 2022 due to rising demand for metals such as gold, zinc, silver and copper etc. Non-metallic ore is forecast to account for more than 30% of the overall industry share by 2022 and would be valued at over USD 9 billion by 2022. The hike in demand can be addressed to flourishing use of salts, lime and phosphate. North America, including U.S. surface mining equipment market size, is anticipated to be driven by the presence of the Appalachian region as it contains more than 50 billion tons of coal reserves. It accounted for over 25% of the overall industry share in 2014 and is likely to be valued over USD 7 billion by 2022. Asia Pacific surface mining equipment industryis expected to be the fastest growing region, valued over USD 8 billion in 2014, with forecast over USD 11 billion by 2022. China surface mining equipment market size is likely to witness significant growth due to rapid growing demand for metal as well as coal in mining industry. Key industry players holding major surface mining equipment market share are BHP Billiton, Vale S.A and Rio Tinto. Other industry participants include Anglo American, Freeport-McMoran, Barrick Gold, Teck, and Goldcorp.